Decent value, retro looks and very intuitive control system for easy operation. At 20 litres in size, it's pretty small - check to make sure this will fit your larger dishes. At around the £70 mark, the Daewoo KOR6N9RW is aimed at those who are looking for a cheap white retro looking microwave. On paper it provides a basic yet functional specification, which will be ideal for those looking for a simple to operate yet reliable appliance for their kitchen. In fact what may make this microwave appeal to others and stand out against the opposition will be the old style design which will perfectly suit less modern kitchen designs. Nautical in style, the window situated in the door is porthole like in shape and size, and the digital display features a similar old fashioned dial feel to it. This particular model is finished in white - however it is also available in a multitude of other colour options, such as red, purple and black. Overall power output is 800w, and capacity is 20 litres - fairly standard for microwaves in this price bracket. It features 5 different power levels, including an auto defrost setting for ease of use. The controls are well labelled, and operating the microwave's various functions was quick and easy. 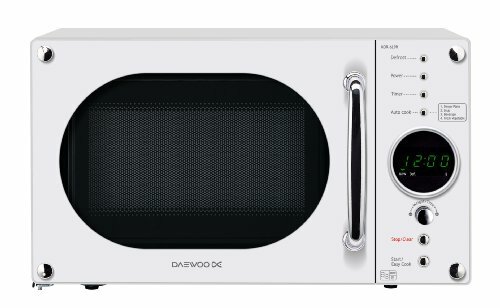 Essentially this Daewoo microwave offers a fairly basic standard specification, and in that sense is pretty similar to a lot of other microwaves in this price bracket. The main selling point is the quirky retro design - if this appeals to you then there's no reason not to purchase this microwave. The Daewoo KOR6N9RW offers pretty good value - essentially it's a cheap retro microwave, which does it's job pretty well.